What do you think about eating with the phone? I mean literally. Not talking on your phone during a meal. Or messaging. Or thumbing through it. But actually using your device as a utensil. That’s the concept of a rather odd Kickstarter campaign. The product is a smartphone case, on the back of which fits a detachable “Phork” and “Sphoon”, as they’re called. Attach the utensils to the bottom of the case and, voila, you can eat while continuously looking at the screen. It can’t possibly be a serious venture, can it? Coverage of the campaign suggests that it may all be a big goof, or perhaps an ironic statement on our phone obsession. Are we starting to look at phones at the table as something that just belongs there, no different from the salt and pepper shakers? 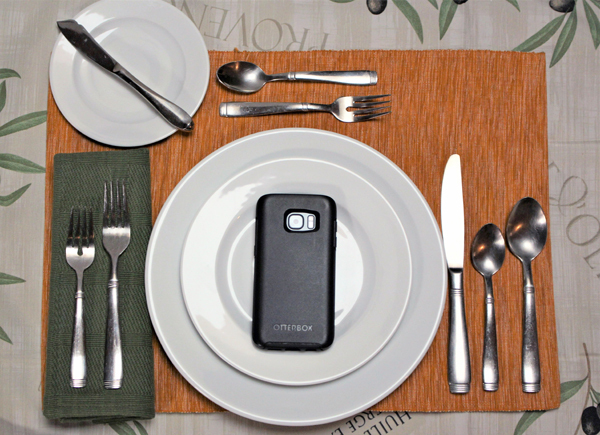 A survey last year found that almost one in three Americans bring their phone to every meal. One in three also said that they eat so mindlessly and fast in front of a screen (whether phone, tablet or TV) that they can’t believe how quickly the food disappears. Distracted eating can influence what we eat, how we eat and how much we eat. Another study, from researchers at the University of British Columbia, revealed that checking the phone at a restaurant leads to a modest but still noticeable decrease in a diner’s enjoyment. No real surprise. Technology at the table makes people feel less socially engaged. History professor Yuval Noah Harari has expressed deeper concerns about this phenomenon in his latest book, called 21 Lessons for the 21st Century. Harari wrote two previous books on how humans and societies have evolved and continue to (Sapiens: A Brief History of Humankind, and Homo Deus: A Brief History of Tomorrow). All three are highly recommended. In 21 Lessons, Harari notes how much easier it is to connect with family and friends anywhere in the world, and how much harder it is to connect to your family at the dinner table because everyone is glancing at their phones. We know that’s happening. Just how much are we losing? Maybe our bodies themselves, suggests Harari. Should the day come when we’re merely disconnected body parts connected to devices, stick a phork in us, we may be done.